I have decided to list my choices of the five most useful rifle calibers available to an International Hunter. I have limited the choices to five calibers to make the selection process less difficult and more definitive. My number one choice is the .17 cal HMR developed by Hornady and Ruger. The .17 HMR is a super hot rimfire cartridge that propels a Hornady 17 g V-Max bullet at 2500 fps. The cartridge is extremely accurate out to 200 yards. The cartridge is excellent for prairie dogs, squirrels, rabbits, and other varmints. I have a Marlin Model 917 VS .17 HMR with a Simmons 3-9x50 scope. The rifle has a two pound trigger job. After I sighted it in, my friend took a few shots. At fifty yards his first shot went right in the middle of the bullseye. We could not find out where his second and third shots went. We went to the target and found out that he had put three shots in the same hole. The rifle and bullet combination is that accurate. The rifle was extremely accurate at 100 yards also. At 200 yards the bullets start to wander a bit. I took my Marlin out to South Dakota. The rifle was murder on prairie dogs and rabbits that were nibbling away at my friend's Buffalo pasture. There is little recoil with this rifle and bullet combination and one can see the effects of the bullet when a prairie dog is hit. The .17 HMR is an absolutely fantastic cartridge! I think this cartridge would be of service in Africa for Rock Hyrax, Dassies, and Black-backed Jackals. My second choice is the .22-250 Remington centerfire cartridge. I shoot Winchester white box 45 g bullets that attain speeds of 4000 fps. This is the ultimate varmint cartridge, routinely capable of hits out to 500 yards. I have a Remington Model 700 VLS rifle with a Nikon 4.5-14x40 Buckmaster scope with Mil Dot Reticule. I have shot hundreds of prairie dogs with this rifle; many of the dogs at 450-500 yards. I also took two Merriam Turkeys out West with this gun. My guide and I saw two big Thanksgiving sized gobblers strutting in a field. We climbed a hill overlooking the Turkeys. We tried to ambush them with my .22-250 Rem. At 400 yards I took a shot and missed. I shot again and missed. The Turkeys sensed our presence and started to run. The largest gobbler was running through some brush. I aimed carefully about six inches over his head. At the shot the Turkey dropped. It had been an incredibly lucky 450 yards shot through the neck! The other gobbler joined a group of jakes and hens. I scoped him at 400 yards and shot him through the neck also. It was very good and very lucky shooting. I think that the prairie dogs that I had been shooting at 500 yards had improved my aim and allowed me to take those two gobblers. I think this cartridge would be of use in Africa for Rock Hyrax, Dassies, Black-backed Jackals, and possibly, Springbok. My third choice is the mighty and venerable .300 Winchester Magnum. This caliber is just as useful as the .30-06 Springfield, but packs a little more punch and a little more distance. The rifle is made for long shots and any animal less than a distance of 300 yards is usually dead meat with this gun. I have a Ruger M77 Mark II Standard .300 Win Mag with a Nikon Buckmaster 4.5-14x40 scope with Mil Dot Reticule. I shoot mainly Remington 180 g Cor Lokt factory ammo. I like to use a Harris bipod when hunting with this rifle. I shot my Moose at 125 yards he hardly flinched. He started to walk up hill and I put another bullet into his back. My guide said to stop shooting. I was going to fire again but the Moose staggered on his feet and crashed to the forest floor. The next time I go Moose hunting I am bringing a .338 Win Mag or a .35 Whelen. The .300 Win Mag is the quintessential African Plains Rifle. I have shot Kudu, Red Hartebeest, Springbok, Gemsbok, Zebra, and Warthog with my .300 Win Mag and 180 g Cor Lokt bullet. The rifle would be sufficient for Leopard and perhaps, Lion. My Professional Hunter said that the .300 Win Mag is enough gun for the massive Eland. 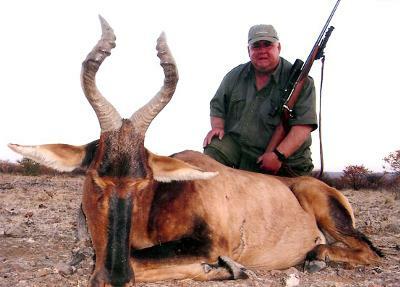 I plan to take an Eland in 2009 with my .300 Win Mag. If I had to have just one rifle to hunt with, I would choose the .300 Win Mag. My fourth choice is the powerful .35 Whelen. This is an old and venerable caliber named after that great rifleman and outdoorsman Col. Townsend Whelen. The rifle is accurate to 200 yards and it packs a lot of punch. It is the ideal Bear rifle; be they Black Bears or the Great Bears of the Northern latitudes. I have taken two Color phase Bears in Idaho with my Remington Model 700 CDL .35 Whelen with Remington 250 g Cor Lokt Factory Ammo. The rifle has a Leupold Rifleman 3-9x50 scope and a 2 pound Timney trigger. It is also an ideal Moose caliber. The next time I go after Shiras Moose in the Bighorn Mountains of Wyoming I am bringing my .35 Whelen. The .35 Whelen is also a good Elk Gun. I harvested a 6x6 Bull Elk in Wisconsin with my .35 Whelen. I am going after Wild Pigs in Texas this March and plan to use my .35 Whelen. The .35 Whelen is an ideal African rifle. I read an article about a hunt in the Dande North area of Zimbabwe where the hunter used the .35 Whelen to take a Leopard and a Lioness. The hunter also harvested a multitude of Plains Game with the rifle. The .35 Whelen packs more punch than the .300 Win Mag and would certainly be a fine choice for Eland and Giraffe. The .35 Whelen is a very useful caliber capable of taking a wide variety of game. The rifle is fun the shoot and enjoyable to hunt with. The recoil on this gun is entirely tolerable. My fifth and last choice is the .458 Lott. The .458 Lott was developed by an American gun smith and big game hunter, Jack Lott, in the early 1980's. Jack Lott had a serious run in with a wounded Cape Buffalo in Africa and wanted a gun with a bit more punch than his .458 Win Mag. He developed the .458 Lott out of .375 H&H brass. The .458 Lott is essentially a .458 Win Mag on steroids. The 500 g Lott bullet travels over 2400 fps and generates over 6000 foot pounds at the muzzle. It is a tremendously powerful cartridge capable of taking Cape Buffalo, Elephant, Hippo, Croc, Lion, and the great bears of North America and Kamchatka. I own a Ruger M77 MKII .458 Lott with a Leupold VX-I 3-9x40 scope. I shoot Hornady 500 g Round Nose Bullets. I have taken two American Bison Bulls with the powerful Rifle. One of my Bison, a 2000 pound monster, made the record book. Both Bison that I have shot have dropped in their tracks. No "Rodeo" ensued after the shot. The .458 Lott is not for the faint of heart. The recoil is seriously bone crunching and shoulder breaking. I have found, however, that one does not notice the recoil in a hunting situation. I plan on using my .458 Lott for Cape Buffalo and Elephant in Africa some day. I read that the Makah Indians of Neah Bay, in Clallum County, Washington, hunt their allotted quota of grey whales with a .577 Tyrannosaur. Maybe the .458 Lott could be used for this purpose also. So, those are my choices for five rifles that would enable the hunter to shoot any animal in the world. I know there are many calibers and many choices available to the hunter. I do not want to argue with anyone, just give information. .35 whelen is a great cartridge. Glad to see it make the list. I would take mine after moose if I could ever draw out a moose tag. I have hunted on 3 continents, and Africa many times and I have killed everything from a cobra to a charging rhino, and I will take the 375 H&H over any 30 Cal. also remember, in many places in Africa there is still a minimum Cal. law which is the 375. I have a dear friend that was hunting in Botswana for a Warthog, with a 300wm and they crossed paths with a Cape Buff. and he charged. My friend fired one shot that didn't even slow him down. The PH had shot 2 times with his 375 H&H Mag. hitting the bull in the head and the front center chest killing the animal, but not before the bull hit my friend and killed him. I use mine for hunting deer as well with a 200 Gr round, that does great. Yes I own many fine rifles, but I will stick with my old friend. After a dozen game animals taken in Africa in my one week hunt I am no expert. But the last 30 years of hunting with one gun I am solidly sold on the Weatherby 340 with 210 grain Nosler or Barnes bullets. The combination has taken elk at over 600 yards and eland with no trouble. It will go to Africa again this spring. Thanks for the article, it was informative, but every shooter has his opinion. I have a Browning A-Bolt chambered in .300 Win. Mag. with a Leupold VX3 3-9X40. I have never had any trouble bringing down any size game with the right factory load. Your .300 should do the same (try using heavier, more solid ammo.) I really like Federal Premium Ammo. (may cost more more, but gets the job done.) I also have a Ruger chambered in 7MM-08 Rem. topped with a Redfield 3-9X40 scope. With appropriate loads the 7mm-08 meets the required standard for moose hunting in Sweden, Finland and Norway. In comparison this is a very small cartridge compared to the .300. The .300 exceeds the .35 Whelen and almost matches the .338 Win. Mag. with the right cartridge. Try using 180 grain Federal Premium Ammo. You should do fine. If a small cartridge like the 7mm-08 can meet the standards, the 300 mag. should be overkill. A 300 WM is one of the most over rated calibers out there. I guided Alaska for 25 years and saw more game wounded with them than all the others combined. It is basically 15% more powerful than a plain old 30/06 but people buy them all the time thinking it is twice as powerful because of the belt and the word "magnum" attached to it. A standard old 35 Whelen with either 225s or 250s on Moose and Bears worked waaaaaaaaaaaaay better than a 300 Mags with 180s ever did, from what we saw actually happen over a 25 years of chasing wounded animals. Folks love to quote the numbers of factory loads for the Whelen and they are very milk toast because of the old Springfields a lot were built on. In the real world most guys are handloading them to 2700fps with RL 15 with 225gr and 2600 with 250s.............. now just stop and think about it? What do you really think is going to work better on a thousand pound animal getting hit with a 180gr 30 cal bullet going 2900fps or a 35 caliber 225gr bullet rolling along at 2700? I have a Browning A-Bolt Medallion chambered in 300 Win. Mag. topped with a Leupold VX-3 3-9X40. Every game animal I have ever taken never made another step (try using a different brand of ammo. Federal works very well for me). Besides the 7mm-08 Remington with appropriate loads meets the required standard for moose hunting in Sweden, Finland and Norway. In comparison of the two cartridges (7mm-08 Rem. & 300 Win. Mag) I would pick the 300 Win. Mag. I would also think no one should have any trouble taking a bull moose with a 300 Win. Mag. with one shot. I'm sorry the orignal design was still drawn on a napkin at a diner (not at a dinner). Still yet Jack Lott had his nasty run in with the cape buffalo in 1959 and he desighed the .458 Lott in 1971 it began production in the early 1980's in custom rifles. I own a Ruger M77 chambered in .458 Lott. My research tell's me Jack Lott designed the cartridge from a .375 H&H mag on a napkin during a dinner in 1971. Still it is a great cartridge and in my opinion recoil is not really bad. Often Moose will soak up bullets from very large guns due to their size and weight. Don't expect a Dead Right There (DRT) result with moose. The 300 Win and 338 Win are very popular here in Alaska for Moose Hunting. From 55gr .223 sabot loads to the mighty 200gr TBBC- the 300WM is all you'll ever need. Your only limit is the scope. I have never hunted Africa, but the animals I have hunted in North America have led me to believe that althought the .17 hmr is very accurate and kills quickly with a well-placed shot it is too wind sensitive. The only thing I would have changed is that you upgraded your bottom two calibers to the .22-250 for the smallest game and the .25-06 to .270 for the medim - sized game. I realize that the .300 can take care of all game animals in this class but it is nice to see an accurate, non-magnum that can really reach out for CXP2 sized game without all the magnum punch. Good article. I enjoyed it. A fairly good article, except you got your wires crossed between the .300 Win Mag and the .35 Whelen. According to the Remington ballistics chart the .300 is between 20 and 25 percent hotter than the .35 Whelen. I have shot over 50 moose, numerous bears (blacks and grizzlies), deer and wolves with my .300 Win Mag at ranges between 50ft. and 600yds. Only ever had to hit 2 moose and 1 grizzly a second time to put them down to stay. I shoot the 180gr. Hornady interbond at 3200fps(handloads) for everything, have always had really good results, excellent expansion and really good weight retention. Accuracy of this load is very good average .75in. at 100yds, sighted in 6in. high at 100yd. dead on at 400yd. and only 15in low at 500yds. and still has plenty of punch left to get the job done as long as the gunner does his part. Thank you for mentioning Wilbur Smith. He is one of my favorite authors. When I read The Sunbird I could not put it down. about hunting game. There is a nice book by an author called Wilbur Smith to do with Kalahari Bushmen being hunted down by poachers. Today everything is commercial I think. Your article was very imformative. What is the .404 jeffrey among North American animals such as moose, deer,and grizzly? Moderate I thought perhaps. Thanx again. Think your choices are little light on the low end, and if eliminated might be able to fill in a few of the gaps at the bigger end. ....with lots of ammo choices! Thanks for the insight of different calibers you shared. Happy hunting! I thought the article was well written, and the caliber selection was very good. I USED TO SHOOT AN M-16 IN TAIWANESE ARMY AND MACHINE GUN.YOU HAVE SELECTED A FINE CHOICE OF GUNS FOR A INTERNATIONAL HUNTER .GOOD PHOTO. As an avid shooter who owns many guns, I know how difficult it was to choose only five calibres. I think your selections were highly creditable. I learned a lot regarding guns and the power behind them. Great information for a beginner like myself.